Yeah, we don’t got no more snow. Why do you ask? 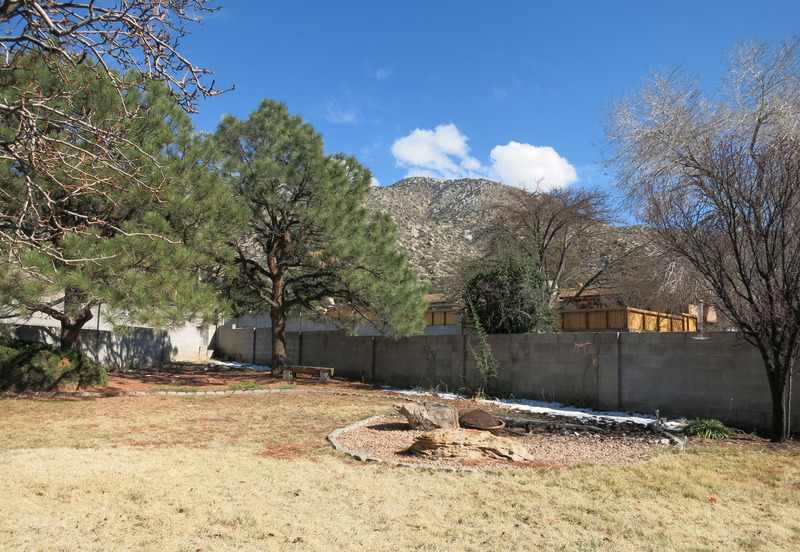 This entry was posted on March 1, 2015 at 2:27 pm and is filed under Albuquerque, Snow. You can follow any responses to this entry through the RSS 2.0 feed. You can leave a response, or trackback from your own site. Sunny and 71 degrees. Perfect for a ride except the 35 mph gusts. Breezy here too, Pat. I had work to do, so I stayed indoors and did it, while cooking up a mess of beans and Mexican rice to have with the leftover green chile stew and chorizo tacos. A day well spent. Tomorrow, I ride. Just our luck. We left Phoenix a day early because of the weather forecast returning thru Duke City to Bibleburg….and encountered blowing snow out of Gallup. Spent the night Friday in ABQ and awoke to 8 inches of snow. Saw some good friends there and watched the snow melt faster than me getting dropped on Independence Pass. Returned to Bibleburg area today in great weather so we could dig out from the 16 inches that had accumulated while we were gone. You managed to hit the best snow we’ve seen in years, JD. Certainly the best we’ve seen in our short time here. It was more like 11 inches in spots in our back yard, and some nice, heavy, wet stuff it was, too. Just my luck we left the XC skis and snowshoes back at Chez Dog. Instead I walked to the neighborhood grocery to fetch tomatillos and serranos for salsa de aguacate. It was vaguely like exercise. Gotta love a place where you shovel snow in the morning and mow the lawn in the afternoon. This happens in the high country. In 1982 we had 9 inches of snow and then a hard freeze that night. The next day was a real mess, especially driving. But the next day, all gone. Not unusual. Life at 4620 feet above sea level. I think, at the end of the day, the advantages of altitude outweigh the disadvantages. I noticed I was outside in a T-shirt and cotton hoodie the other day when it was 19°. But it was a sunny 19°, which makes all the difference. Word. Gimme altitude. The most miserable I can recall being as an adult was when I lived at 235 feet above sea level in a place that was not a desert. Yep, we had about 12-14″ on the deck by Saturday night. Right now you would never know it had snowed. I am surprised you haven’t sunk the fangs of the Perro Loco into the Imnotayahoo speech today to the assembled servants of Sheldon. My 9mm hole making device is out for repairs, so I can watch it and the TV is safe. On the other hand, there are some small granite slabs sitting around the house in honor of my dissertation work.